This post was updated at 5:10 p.m. on 9/11/15 with a comment from the mayor. Artists in Burlington's South End scored a major victory Friday in their campaign to prevent housing gentrification that could price them out of studios along Pine Street. Burlington Mayor Miro Weinberger announced Friday that he will not support housing in the Pine Street Enterprise Zone where it is currently prohibited. In an opinion piece published in the Burlington Free Press, Weinberger acknowledged that opposition from artists played a role in his stance on housing in PlanBTV South End, a proposed city plan for the area, which has been under discussion for months. 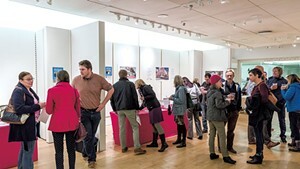 The Enterprise Zone’s current restrictions against housing have "allowed industry, the arts, and entrepreneurial spirit to flourish over the past two decades and slowed gentrification that has the potential to displace much of what we love about the South End, and only limited introduction of housing has been contemplated," Weinberger wrote. "However, the focus and concern about housing is distracting the much-needed, much broader discussion of the future of the South End. Thus, after listening carefully to this debate, I will not support a final plan that recommends adding housing as an allowable use in the Enterprise Zone." He added: "Resolving the debate about housing will bring more focus to the many other important and exciting recommendations in the plan that will require consensus and considerable collective action to implement. " 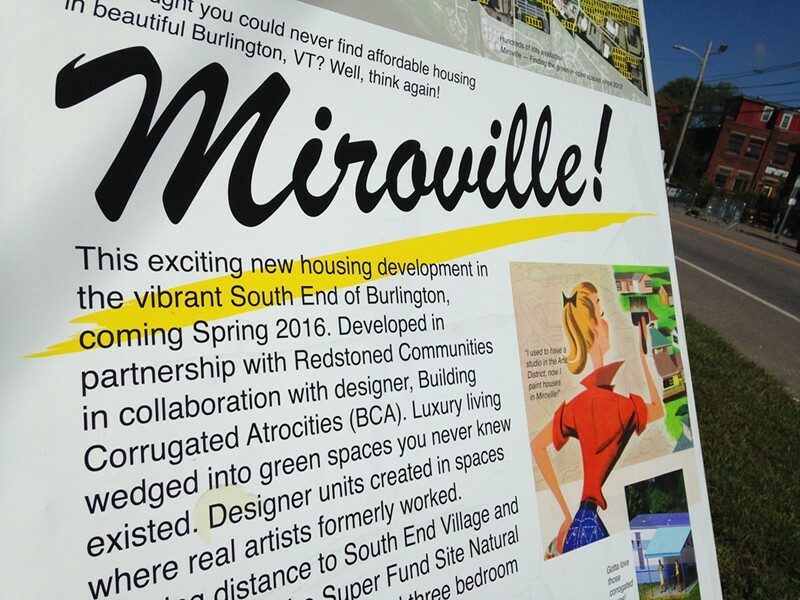 Sign promoting "Miroville" on Pine Street in Burlington. The announcement came as artists dished out a new batch of political satire bashing what they see as the Mayor's overemphasis on housing and other development. The throngs who attend Art Hop will see an installation called "Miroville" across from ArtsRiot on the west side of Pine Street. 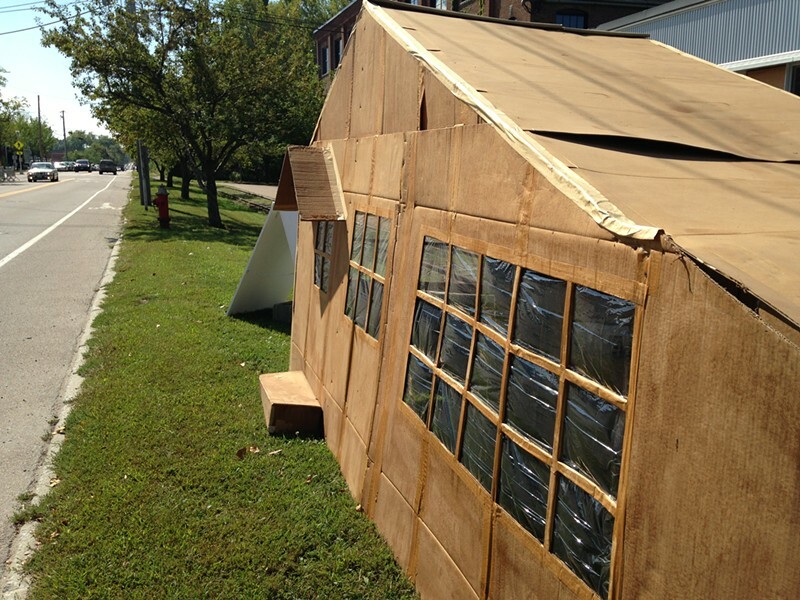 The six-by-14-foot cardboard house, complete with a portrait of the mayor inside, is accompanied by a sandwich board with a chirpy promotional blurb. 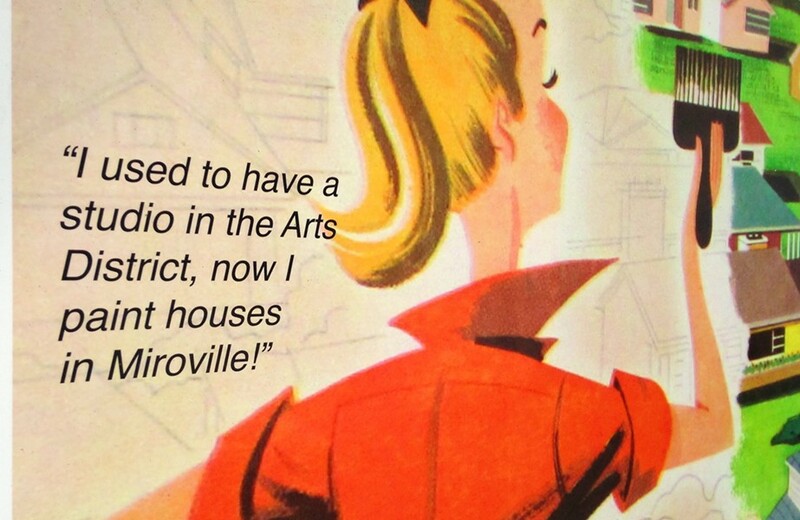 Miroville will offer "luxury living wedged into green spaces you never knew existed. Designer units created in spaces where real artists formerly worked," the sign reads. It also shows a ponytailed woman, outfitted 1950s-style, holding a paintbrush and saying: "I used to have a studio in the Arts District, now I paint houses in Miroville." For more information, the sign directs the curious to contact "Penny Monger and Nomar Greenspace." The cardboard model home for "Miroville." The mock model home was the work of about 10 or 15 artists, said Jason Weinstein, a mosaic artist who helped with effort. He was pleased to learn of the Mayor's announcement Friday. "That's awesome," he said. "It makes me feel like we've been heard." Weinstein has a studio along Pine Street in the Howard Space building. Housing isn't compatible with the arts and industry and new residences would inevitably lead to problems, he said. "We won't be able to work late at night.... We'll be keeping somebody and their baby up at night." Should "Miroville" come down now that the Mayor is backing off housing in the Pine Street corridor? No, said Weinstein. "Miroville" is a "little bit snarky," but pertinent, he said, adding that he understands Weinberger and his administration have a tough job to do. "I hope they take it in fun." How does the mayor feel about Miroville? Asked for his opinion Friday afternoon, Weinberger confirmed that he has driven by the installation. He said he’s glad artists are participating in the planning process, but he sounded frustrated, saying he believes there has been “oversimplification and distortion” of some of his positions on development, especially housing. “What are we going to do about the fact that we have a real serious housing challenge?” the mayor asked.